As part of our commitment to excellence through diversity and inclusion, California State University, Northridge (CSUN) strives to ensure that campus communication and information technology is accessible to everyone. The California State University system statement on accessibility is articulated in California State University - Executive Order 1111, in accordance with both federal and state laws including the Americans with Disabilities Act of 1990 (ADA) and Section 508 of the U.S. Rehabilitation Act. Read CSUN's full accessibility statement. Need assistance or have a question not answered here? Please contact the Universal Design Center (UDC) at or, during business hours (Monday through Friday, 8am to 5pm Pacific time), at (818) 677-5898. 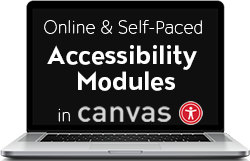 What is Accessibility? What is Universal Design? In this context, “accessibility” means that people with disabilities have access – to facilities, to information and to technology. 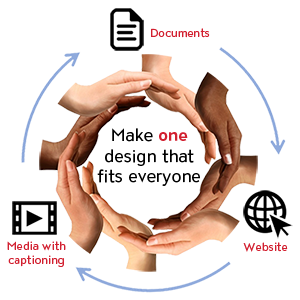 “Universal design” takes this concept one step further, to ensure that everyone can perceive, understand, engage, navigate and interact regardless of ability or preference. The UDC supports the campus community in their efforts to make it possible for individuals to learn, communicate, and share via information and communication technology. One way we do this is by assisting the campus community to ensure their information and communication technology is interoperable, usable and accessible, so that individual learning and processing styles and/or physical characteristics are not barriers to access. The role of the UDC is to help CSUN implement business practices which enable the campus to meet policy standards under the Accessible Technology Initiative Coded Memoranda. Everyone has a part in creating accessible and usable information. The responsibility of creating and maintaining accessible content falls to the entire campus community.